The journal publishes papers based on experimental evidence and data, theoretical papers, and comprehensive review articles. The journal especially welcomes empirically rigorous papers that take policy implications seriously. 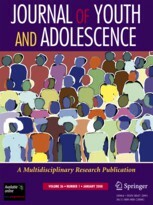 Research need not have been designed to address policy needs, but manuscripts must address implications for the manner society formally (e.g., through laws, policies or regulations) or informally (e.g., through parents, peers, and social institutions) responds to the period of youth and adolescence.